American Rubyspot: pale stigma that can, however, be small and rather inconspicuous. Wings tips areclear. 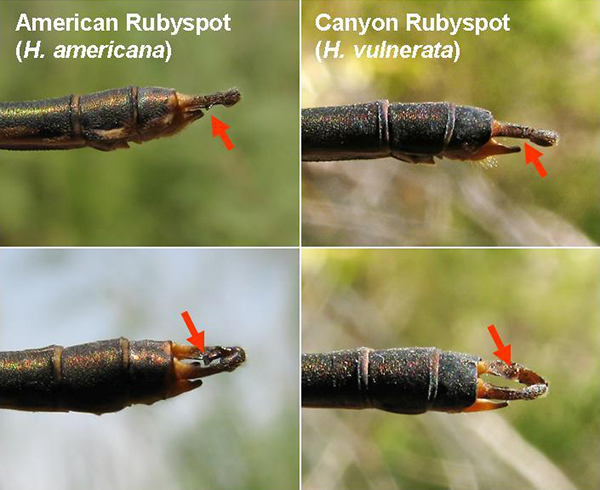 Lateral views of the male appendages of the American and Canyon Rubyspots, AZ. Canyon Rubyspot: front of thorax generally metallic green; wide pale antehumeral stripe. Lateral views of the head and thorax of the American and Canyon Rubyspots, AZ.